Bears have been seen in several areas of South Tillamook County. Bears like to scrounge through garbage cans for a free and easy meal. You have to be proactive in protecting our bears and the way you can do this is by managing your garbage better. 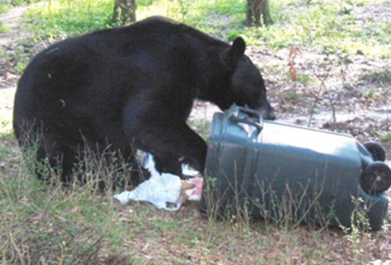 If you don’t take care of your garbage properly…..
You may be signing a Death Warrant for a bear! Bears hunt with their noses. If your garbage can stinks of used food they will find it. By taking these easy steps you can reduce the chances of bears and other animals getting into your can. Click here for a printable (PDF) version of this information. Oregon is home to about 25,000 to 30,000 black bears, North America's most common bear species. Generally black in color, they can also be brown, cinnamon or blond. Fast and agile, they are good swimmers and climbers who prefer forests, trails and streams.